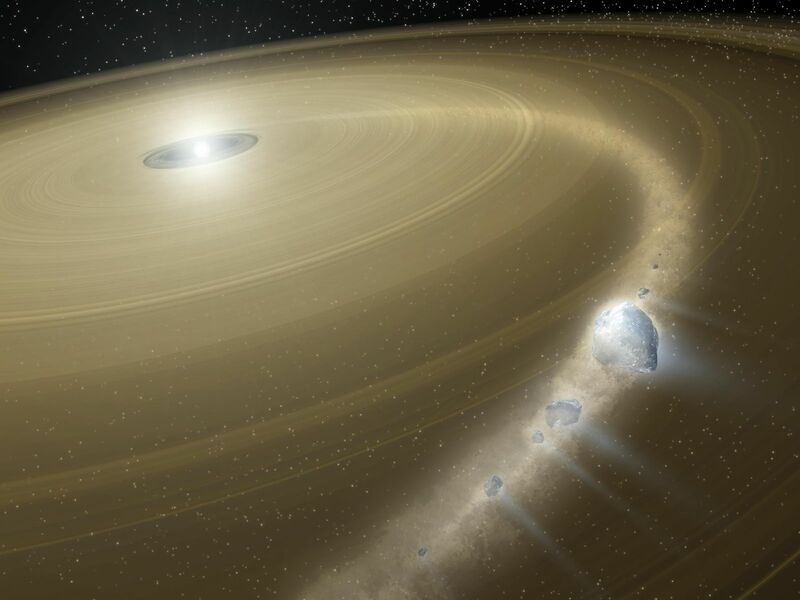 This artist's concept illustrates a comet being torn to shreds around a dead star, or white dwarf, called G29-38. 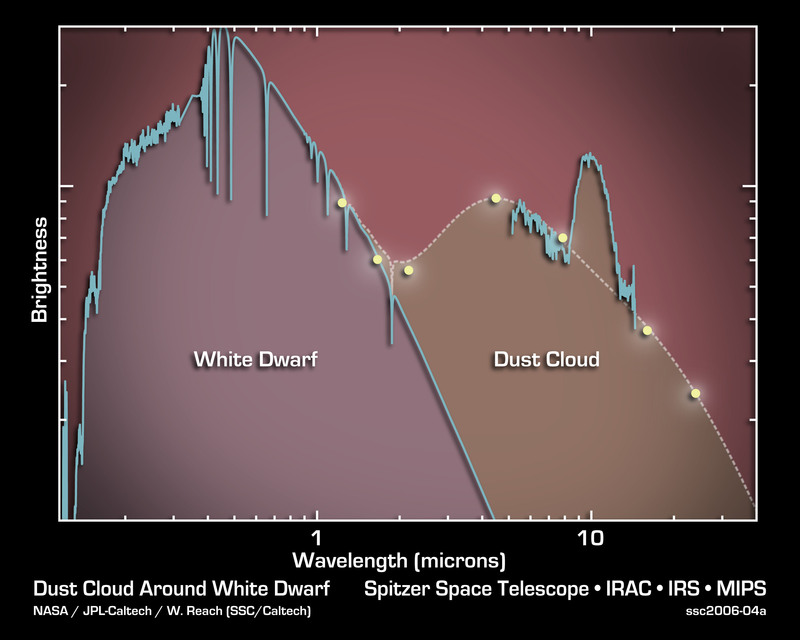 NASA's Spitzer Space Telescope observed a cloud of dust around this white dwarf that may have been generated from this type of comet disruption. The findings suggest that a host of other comet survivors may still orbit in this long-dead solar system. The white dwarf G29-38 began life as a star that was about three times as massive as our sun. Its death involved the same steps that the sun will ultimately undergo billions of years from now. According to theory, the G29-38 star became brighter and brighter as it aged, until it bloated up into a dying star called a red giant. This red giant was large enough to engulf and evaporate any terrestrial planets like Earth that happened to be in its way. Later, the red giant shed its outer atmosphere, leaving behind a shrunken skeleton of star, called a white dwarf. If the star did host a planetary system, outer planets akin to Jupiter and Neptune and a remote ring of icy comets would remain. The Spitzer observations provide observational evidence for this orbiting outpost of comet survivors. Astronomers speculate that one such comet was knocked into the inner regions of G29-38, possibly by an outer planet. 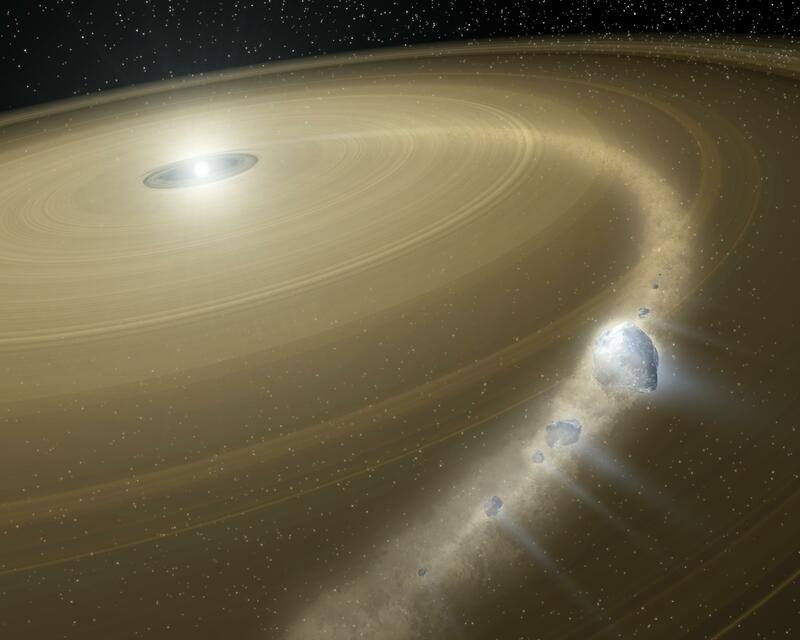 As the comet approached very close to the white dwarf, it may have been torn apart by the star's tidal forces. Eventually, all that would be left of the comet is a disk of dust. This illustration shows a comet in the process of being pulverized: part of it still exists as a chain of small clumps, while the rest has already spread out into a dusty disk. Comet Shoemaker-Levy 9 broke apart in a similar fashion when it plunged into Jupiter in 1994. 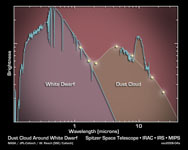 The graph of data, or spectrum, from NASA's Spitzer Space Telescope indicates that a dead star, or white dwarf, called G29-38, is shrouded by a cloud of dust. The data also demonstrate that this dust contains some of the same types of minerals found in comet Hale-Bopp. 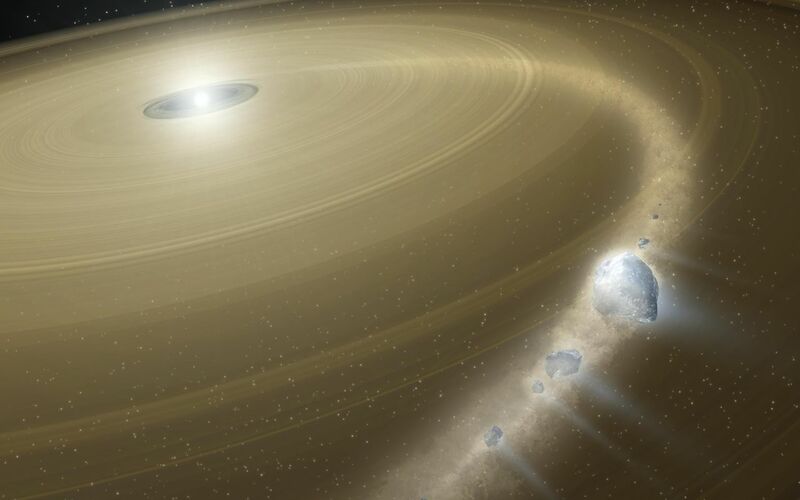 The findings tell a possible tale of solar system survival. Though the dust seen by Spitzer is likely from a comet that recently perished, its presence suggests that an icy distant ring of comets may still orbit the dead star. These data were collected by Spitzer's infrared spectrometer, an instrument that cracks light open like a geode, revealing its coveted components. In this spectrum, light from the white dwarf is on the left, at ultraviolet and visible wavelengths. The spectrum on the right, at infrared wavelengths longer than about 2 microns, shows much more light than can be explained by a white dwarf alone. The bump seen around a wavelength of 10 microns offers a clue to the source of this excess infrared light. It signifies the presence of silicate minerals, which are found in our own solar system on Earth, in sandy beaches, and in comets and asteroids. These silicate grains appear to be very small like those in comets, so astronomers favor the theory that a comet recently broke apart around the dead star.